You don’t necessarily expect a primer on quantum computing to break out at a reverse logistics convention, but maybe that’s what smart organizers do. Yes, they offer pragmatic sessions on the nuts and bolts of the business, and they look ahead at where the market’s going, but they tantalize too. The Reverse Logistics Association ticked all those boxes this week. Among the nuts/bolts was a look at the effective use of social media. Particularly interesting was Christopher Sirois of LiquidationOH and his use of a Facebook group. Creating a community around buying and selling seems like smart collaboration in an industry that isn’t static. Looking ahead, they brought in Amazon’s Eileen McKeown and Ryan Moss to discuss the impact/opportunity of Amazon’s new marketplace Amazon Renewed. Their overview explained parameters for resellers/refurbishers who want to participate and they were generous in answering questions one-on-one with conference attendees. Wrapping up a busy day’s session with something completely out of the box, Willaim Hurley, or just “whurley” as he likes to be known, brought a light touch to a hard subject. He made us want to go visit his website strangeworks.com. Quantum computing is closer than you think, possibly stranger too. 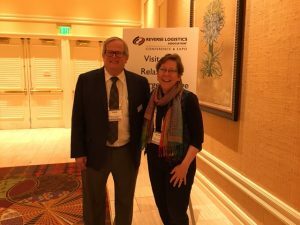 We want to shout out a thanks to Mark Erickson of the Reverse Logistics Association, who made it possible for us to attend the conference. We learned a lot, made some good contacts and came home energized.